Like many European cities, Prague is best explored on foot. Much of this Czech city’s center has been declared as a UNESCO World Heritage site and many buildings from the 13th through 18th centuries preserve Prague’s rich legacy. From the reign of Bohemian royalty up through the fall of Communism, visitors will discover many historic facets by wandering through neighborhoods and even climbing up to a district or two. So get your best pair of comfortable shoes ready (think flat) and read up on this guide to walking around areas worth seeing. Don’t worry if you happen to get lost while wandering around Prague’s Old Town. Old Town has winding alleys and cobblestone streets, and one landmark that lets you know you’re in the right place is the Old Town Powder Tower. Built as one of the walled city’s major gateways, the Powder Tower also marks the way the beginning of the ceremonial route that soon-to-be Bohemian kings would venture down their way toward Prague Castle. Once as a fortification, the structure later was used for storing gunpowder. Your path will eventually lead to Old Town Square, a colorful center location buzzing with shops, restaurants, cafes, and landmarks during the day and evening. The square’s key attraction is the Astronomical Clock gracing the Old Town Hall. On the top of each approaching hour, from 8 a.m. to 8 p.m., crowds gather in front of the 600-year-old clock to watch as two doors open to unveil a procession of rotating figurines. If you would like to have a less-crowded look at the square, go inside the building’s tower to reach the top for panoramic views of the city. There are two choices for going up: by elevator or stairs. With the latter, make sure you’re prepared for serious steep climbing. Purchase tickets for entry. Near the National Theater, find a bronze plague graced with hands in a peace sign. Called the Národní Memorial, it is located on Národní Street No 16, making the place where riot police beat college students holding a peaceful protest on a cold night in November 17, 1989. 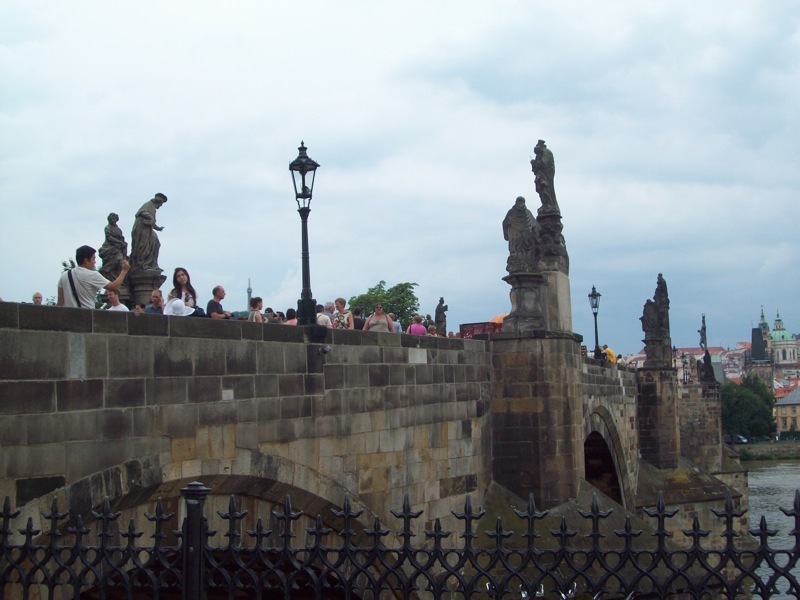 Leaving Old Town, visitors must take a stroll along Prague’s famous landmark: Charles Bridge. Like-minded travelers will stop for picturing taking and posing, and people watching, near the about 40 statues gracing this 650-year-old promenade. These statues represent various Catholic saints and martyrs placed here as a way to convert locals to Christianity. Walk alongside fellow tourists, vendors and street performers and artists here, and observe cruise vessels gliding along the Vltava River. If you happen to notice various colored locks fastened to the bridge’s rails or even on statues, you’re seeing love notes. Couples who want to symbolize their love will jointly place a lock upon this bridge, then throwing the key into the water. You may spot locks on other bridges around the city as well. Charles Bridge does get crowded during the day, but you can get a different perspective at night. The other end of Charles Bridge leads you to Mala Strana (Lesser Town), a Baroque section of Prague originally settled by German merchants. 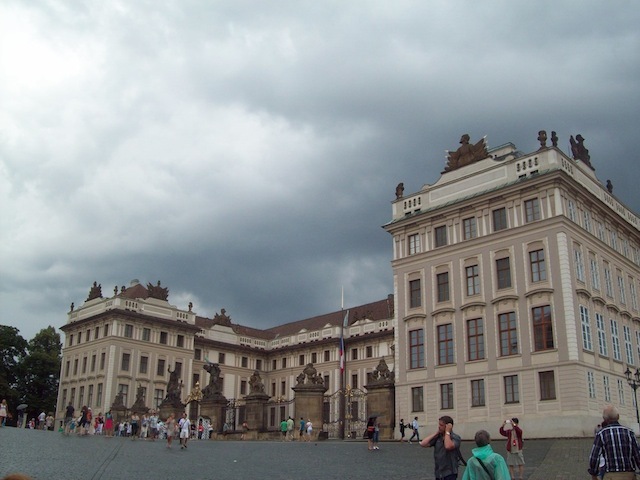 Malá Strana has been a home for diplomats, merchants and those who served at Prague Castle. Red roof houses and prominent churches are found here. Serious shoppers can journey up Nerudova, a steep alley lined with stores from Lesser Town Square up to Prague Castle. For another look at lavish living, Wallenstein Palace was built by a duke in the mid-1600s, and today showcases a complex with a garden. It’s now being used by the Czech Senate. 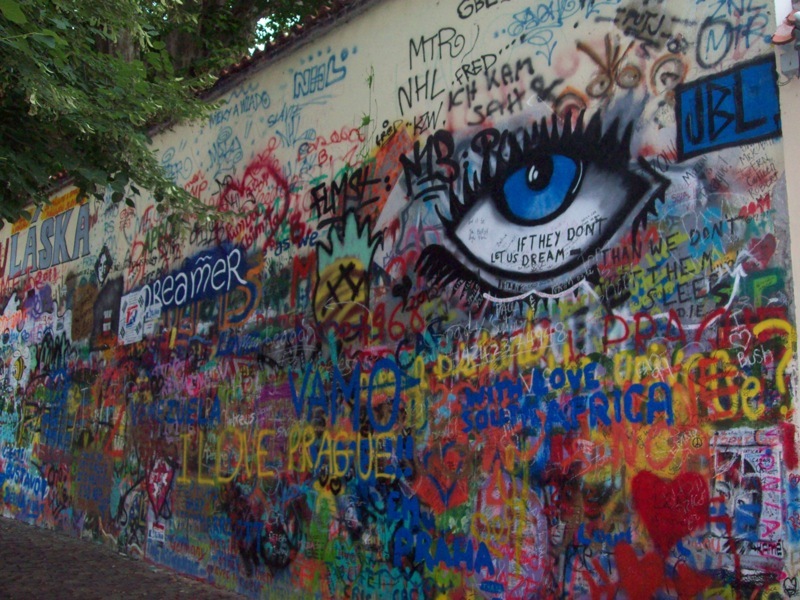 Situated in Kampa Neighborhood, John Lennon Wall, also known as Lennon Wall, is a colorful permanent fixture since the 1980s. This space has been decorated with peace-minded graffiti inspired by John Lennon and lyrics from Beatles songs. Around 1988, the wall became a source of contention for the then-Communist regime. Students would write on their grievances over, and have clashes with, political leaders of that era. When authorities would order for the wall to be repainted, would almost shortly be graced with poems and pictures shortly after. The neighboring French embassy asked officials to leave the wall alone, and this request still has been respected. Whether you prefer to take Tram 22 or hike up this hilltop complex, Hradčany’s Prague Castle has remained the seat of power, first with the Czech royal family and now its government, and also religiously, since the ninth century. An hourly changing of the guard ceremony at the front gates occurs. A more formal presentation happens daily at noon inside the castle’s first courtyard. Top sights include St. Vitus Cathedral, built in various phases starting in 1334; the Old Royal Palace, which is still used for special state occasions; the Powder Tower, which once stored gun powder and housed cannons; the European masters branch of the National Gallery; and Golden Lane and Daliborka Tower, a street lane with tiny houses built into the castle fortifications. There is no cost to enter and explore the courtyard of this complex, but paid admission is required for entry. On your way out, choose to walk back down the hill through Nerudova or venture through the Petrin Hill gardens. A series of four sculpted baroque gardens on the hill below Prague Castle are also worth seeing. Emerging over Lesser Town and across from Prague Castle, the park Petrin Hill has gardens and orchards and man-made attractions such as Petrin Tower, a miniature replica of the Eiffel Tower. 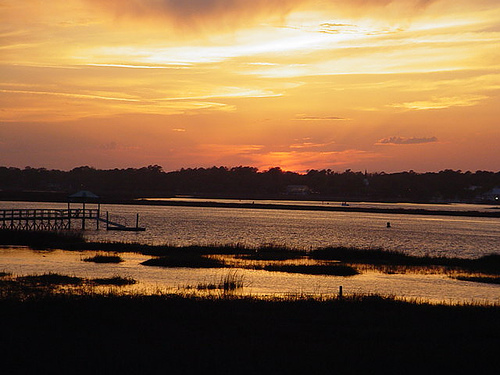 Climb up the 194-foot tower to reach the top for another striking view of the city’s landscape. Petrin Hill also is the location for a labyrinth of mirrors and an observatory. To venture up Petrin Hill, buy a ticket for a ride on the funicular. Within Josefov, this former Jewish ghetto once served as a thriving community for Jewish citizens for about five centuries until city authorities cleared the area to make way for luxury buildings. This quarter features a cast iron statue honoring Franz Kafka, which sits on Maiselova Street, one of the quarter’s two main streets. The Jewish Museum symbolizes the heritage of residents not as a single building, but a collection of four preserved synagogues, a ceremonial hall, and a historic cemetery. Each synagogue holds different exhibits on Jewish customs and history. The Old-New Synagogue is Europe’s oldest remaining Jewish worship, while the Old Jewish Cemetery is one of the world’s most crowded. 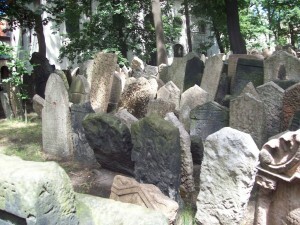 One block area holds many graves, with tombstones literally positioned on top of each other. Tickets are required for entry into these religious sites, with Old-New Synagogue requiring a separate ticket. Between the Jewish Quarter and Old Town, Jan Palach Square is named for a 21-year-old college student who set himself on fire to protest the Soviet invasion in the late 1960s. Today, a memorial to him is found here. Established as a municipal development and founded by Charles IV in the 14th century, today’s New Town is a haven for hotels, restaurants and clothing stores. 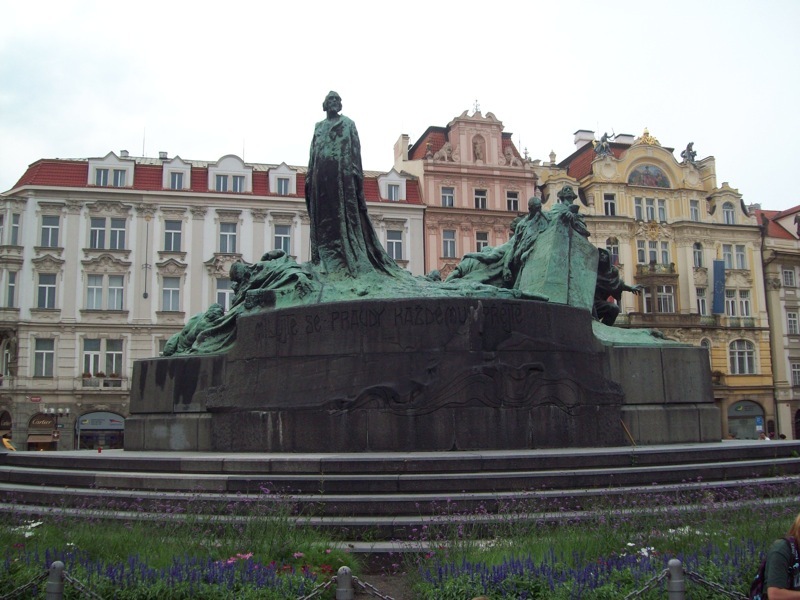 The historic, half-mile Wenceslas Square is Prague’s commercial focal point. Formerly a horse market, the square was site of significant moments during the Velvet Revolution in 1989, with organized mass demonstrations taking place. Also in this neighborhood, Charles Square once functioned as a cattle market, and nowadays serves as both a park surrounded by buildings and a transport hub intersected with tramlines. So, when in Prague, get walking! Great piece! I loved Prague and you are right- walking is for sure the way to go. I have to ask though- were you as disappointed with the astrological clock as I was?! Thanks Hannah. I thought there would be a bit more with the clock, but it is a nice work of art!